Grand Texas Theme Park- Greased Lightnin' Roller Coaster NOT Returning. The New Theme Park, Grand Texas is ready to begin construction but they've got some bad news for possible future guests. While people may be calling the park "The New Astroworld" it will be missing a key piece of the now extinct park. While Grand Texas had planned to rebuild the classic Schwarzkoph Shuttle Loop roller coaster, those plans have now been scrapped. 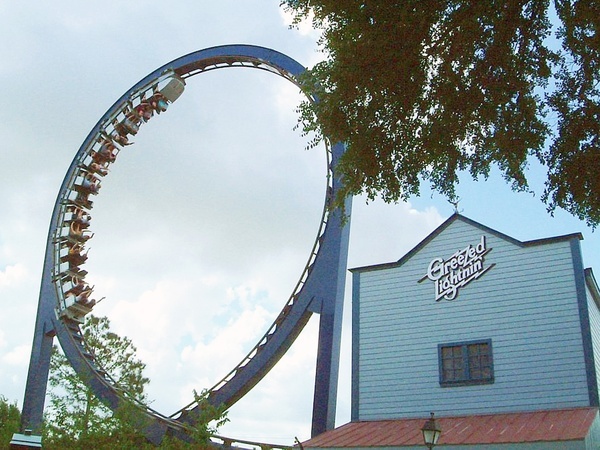 Greased Lightnin' was sold when Astroworld closed and has changed hands at least twice. However, the once iconic ride has never been re-assembled at either park which owned it. We're unsure if the current owner refuses to sell the ride or if this is purely a money issue.. but Grand Texas has announced they won't be getting the once iconic thrill ride. Rather Grand Texas has stated they will be building another roller coaster, which promises fans a trip down "Coaster Memeory Lane". The park is being very quiet about what the new plans may involve but they are currently promising disappointed fans that the new ride will be a "taller, faster and similar" ride. Could Grand Texas be looking at a New Shuttleloop Coaster? Perhaps another model from another park? Right now, no one seems to know. We'll bring you more information as it becomes available.